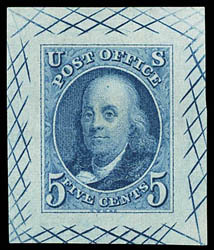 1847, 5¢ deep blue, trial color large die proof on bond, 28 x 33mm with typical cross-hatching, crisp impression, fresh and Very Fine. 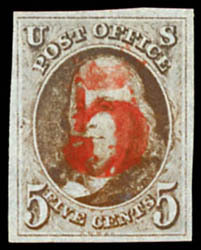 1847, 5¢ orange brown, double transfer (type "C"), showing double transfer of all frame lines, the numerals 5 and "Five Cents", light red grid cancels, large margins all around, rich true orange brown color, Extremely Fine and choice, Scott catalog value for the normal red brown shade; with 2015 P.F. Graded certificate (XF 90 XQ). Scott No. 1b var. $10,500. 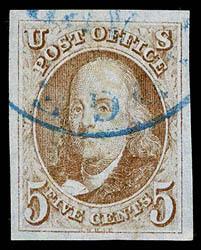 THE FINEST KNOWN EXAMPLE OF THE 1847 5¢ TYPE C DOUBLE TRANSFER IN THE SCARCE ORANGE BROWN SHADE - A GREAT RARITY IN BOTH CONDITION AND VARIETY. 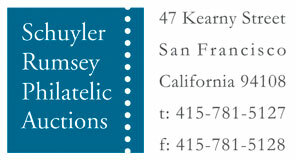 A search of the Philatelic Foundation "Certificate Search" for any comparable revealed only a single faulty example. 1847, 5¢ red brown, color chart, lot of nine used singles on elegantly prepared color chart, all stamps are mainly large margins, shades reportedly include Red Brown, Pale Brown, Brown, Dark Brown, Grayish Brown, Blackish Brown, Orange Brown, Red Orange and Brown Orange, the chart has not been verified for these shades and is being sold solely on the basis of nine used #1's, Very Fine. 1847, 5¢ red brown, neat blue town cancel, large well balanced margins all around, strong bright color, Extremely Fine to Superb, a handsome large margin gem; with 2017 P.S.E. Graded certificate (XF-Sup 95, SMQ $1,350). 1847, 5¢ red brown, bold red St. Louis, Mo. town cancels, ample to huge margins showing portion of adjacent stamp at top, rich vibrant color, Extremely Fine and attractive, a striking stamp, SMQ value without cancel premium; with 2006 P.S.E. and 2013 P.F. certificates, the former Graded (XF 90, SMQ $675). 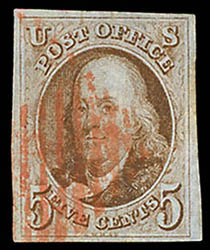 1847, 5¢ red brown, socked-on-the-nose strike of red numeral "5" cancel, ample to large margins, strong color, Very Fine and choice; with 2016 P.F. certificate. 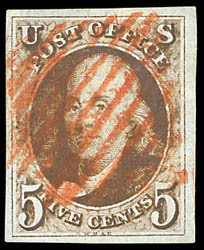 1847, 5¢ red brown, full to large margins, beautiful color, red New York square grid cancel, fresh and Very Fine. 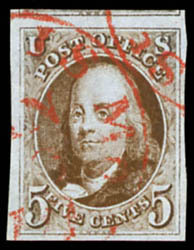 1847, 5¢ red brown, neat red grid cancel, large to huge margins showing portion of adjacent stamp at top, bold color and crisp impression, Extremely Fine; with 2016 P.F. 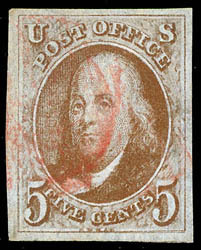 Graded certificate (XF 90, SSV $625). 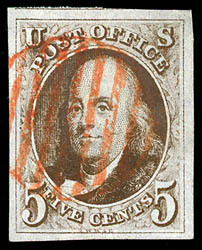 1847, 5¢ red brown, red square grid cancel, full to large margins, rich deep color, Very Fine and choice; with 1979 P.F. certificate. 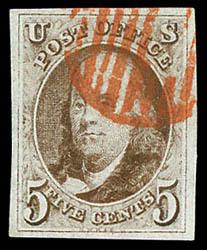 1847, 5¢ red brown, red grid cancel, four large margins, strong color, Very Fine and choice; with 1988 P.F. certificate.